Now, the story that has thrilled countless millions comes to life in a brand new way in this exciting production. You’ll hear the story of Jean Valjean, an ex-convict whose whole life is suddenly transformed by a single act of kindness. 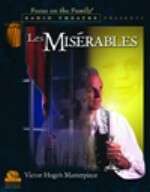 You’ll also hear the story of Javert, the police inspector whose only dream is to put Valjean behind bars. A faithful adaptation of the Victor Hugo novel with fine English actors with film-quality sound design and music, it will mesmerize adults and families alike.